We have had an interesting week this last week. 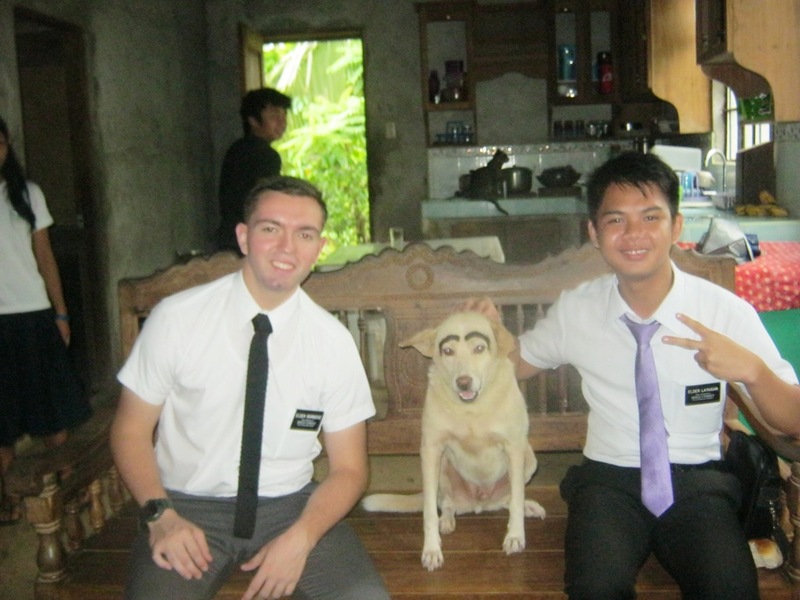 I am both excited and sad – excited because I got a new companion named Elder Sinilong but a little bit sad because my New Zealander companion got transferred! But that’s okay – I loved him like a brother though so I’m sad that he’s gone. But Elder Sinilong should be fun too. He is from the City of Davao which is in the Southern part of the Philippines. He goes home in November so I’ll most likely “kill him off” and send him home. I have really enjoyed my companions throughout the mission so I have been very fortunate in that regard. Me, a dog with eyebrows, and an Elder from my Zone! Ahhhh mission life! Mom asked what some of my duties are as a Zone Leader, so I’ll give a little bit of information on that. We go on exchanges, or swaps, with each District Leader in the zone as well as with other missionaries that may be struggling, or just for status control. Each week we report the zone’s numbers to the Assistants to the President (A.P.’s) in the mission office. We also get to go to Mission Leader’s Council every first Friday of each month to get training and counsel from the Mission President. We are then expected to share that information with the missionaries in our Zone during a training meeting the following Wednesday. We also assist stake and ward leaders in fulfilling their purpose as leaders of the church. We meet once a month with the stake president to discuss concerns, needs, success, goals, vision, etc., in order to help the stake progress effectively and efficiently. We also coordinate and share with him the desires of the mission president. I have also learned from past Zone Leaders that I have had that I also need to be a good friend and helpful person to everyone in the zone. People tend to get lonely in the mission, even with a companion, and it’s always nice just to have a friend, so i’ve added that one to the list of my responsibilities too! The zone is comprised of missionaries from throughout the world, but there’s a new American in our zone this transfer from Boise, ID. He’s being trained by an elder in the town of Paete. There are also four sisters in the zone, one of which was with me int he MTC. We also organize a zone P-day activity once a transfer so that we can become unified in the work and get to know each other better. We are still working on strengthening the relationships between missionaries and members here in Siniloan. The members need to feel that they can trust the missionaries but that goes both ways because the missionaries need to earn that trust. But we are making progress! Our branch president, who is the leader of the local church in this area, is awesome! If we ask him to do something, he does it so we have a good relationship there. We are working together to instill a sense of self-motivation – for example in home teaching which needs to be improved. The branch is really cool though because there is a neat group of older sisters (much like Sisters Gum, Cunningham, and Evans in our ward back home). Well, I love you all so much. Eleven months left and that’s it! Thanks for the support – I really can feel your love for us missionaries. I miss Hunter a lot sometimes and hope that we’ll continue to be close after the mission. I think about it a lot – but I am sure it will all work out for the best.